Bathroom Renovation requires a lot of hard work. You need to think about all your options and resources. You need to determine the color scheme that you are going for. You need to see what and exactly how big of a change are you looking forward to while restyling your bathroom as well as your house. But most importantly you need to a lot of research on the retail shops around. There might be several of those in your town as well as several of those that specialize in dealing over the internet. There are many independent natural stone dealers who charge much less than the retail home improvement shops. It all depends up on what do you want and from where are you getting it. While you are planning for the shower shelves, it is better if you stay away from the plastic shelves that hang from a rod and protrude from the wall. They are cheap but they take away all the look of your shower cabin and design and also risks of knocking your things up each time they receive the slightest of jerks. Instead opt for ceramic shelves, or built in shelves. They look classy, elegant and add so much amount of sophistication to your bathroom. And despite all of that they are not very expensive as well. If you wish to change the tiles of your bathroom floors for bathroom renovation, then the best way to do it is by removing the underlayment as well. Removing tiles is a daunting task as some of them are stubborn and are glued to the surface. This makes it very hard to peel them off. A smart way of doing is that you remove the underlayment as well, cautioning not to touch the undersurface. Many a times the underlayment gets damaged due to water especially around the toilets and in this way you can buy yourself a completely new and clean canvas as well as removing the damaged material out of the way.This will save you a lot of money for the future as well.While tiling up the floors and walls of your bathroom, you need to figure out which color, design and shape of the tiles you need. Also, play with the contrasting colors of the same design as well as few sheets of a different design around the borders and edges or shelves just to add that right punch of sophistication. Do a bit of mix and match and you’ll see how trendy your bathroom looks. Lightening is again another big part of bathroom renovation. Be sure of your re switching your cables and select few but good looking energy savers and bulbs so that your bathroom gets the perfect illumination. It isn’t necessary that you do all the work yourself. 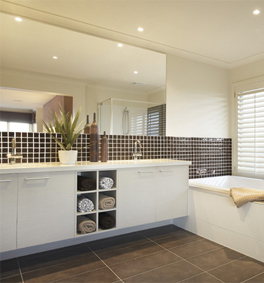 You can get an interior decorator to help you create your perfect bathroom. Or if you want to do things yourself but find certain tasks complicating then its best if you seek help of a professional. Remember taking a bit of professional support will help you not just now during your bathroom renovation but also in the future.Determine which part of your bathroom needs the most decoration. Is it the vanity and mirrors, or the shower area, the tiles or the bathtub? Rack in your maximum budget on the area of interest so you can get the ideal bathroom renovation that you are looking for.